Eco-Strip is a carton stripper allowing fast diecut waste removal from folding carton, E-flute and corrugated boards.Comparing with the traditional manual waste stripping method, Eco-Strip enhances the working efficiency greatly. 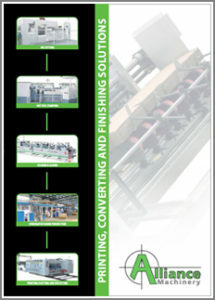 When using Eco-Strip, the outside trim areas of folding carton cutting die must be installed with stripping rules, and use Eco-Nick to grind nicks; otherwise the stripping result will be affected. • Motor Max. speed : 6000 r/min. • Air pressure : 7.5 bar. 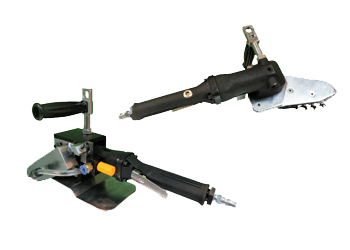 • Powerful pneumatic motor guarantees smooth stripping. • Solid and rigid steel construction. • Stripping waste with maximal efficiency. 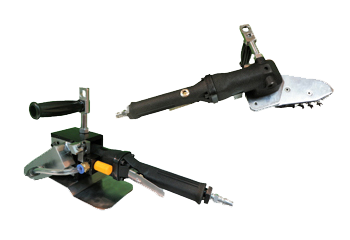 • Extremely safe, easy and comfortable to operate. 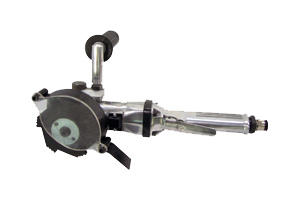 • The hardened-steel stripping wheel guarantees longer lifetime. • Eco-Strip is designed for the sole purpose of clearing waste of carton boxes. • Eco-Strip is a manual device. After connecting to air pump, press the rotary switch for normal operation. • Eco-Strip is to be installed and operated in a post-processing waste stripping area. • This device is specially designed for the universal use of removal of large & small segment waste from diecut sheets with no damage to the carton blanks, which can improve the gluer productivity. • Conforms to Oriental hand shape, which can be moved flexibly and lightly. • The stripper is only designed for the sole purpose of cleaning waste of cardboard, E-flute and regular corrugated board, not available for other application. • 200g/-500g/ solid board, single/double corrugated board, laminated double coating corrugated board are available of paper range. • The stripper is only designed for the sole purpose of cleaning waste of cardboard, E-flute and regular corrugated board.Stripper achieved high-speed cycle working through air motor to drive tooth chain, chaff tooth will be used to tick off and clear up waste deckle edge. • The stripper is a high- efficient manual tool ,compared with the traditional stripper’s method by hammer, stripper could improve the speed at least above 5-10 times. • Compact structure, light-weight design and easy operation;male or female operator could handle it through a simple training. • The stripper’s power cause by air motor, thus safe operation and long productive life.